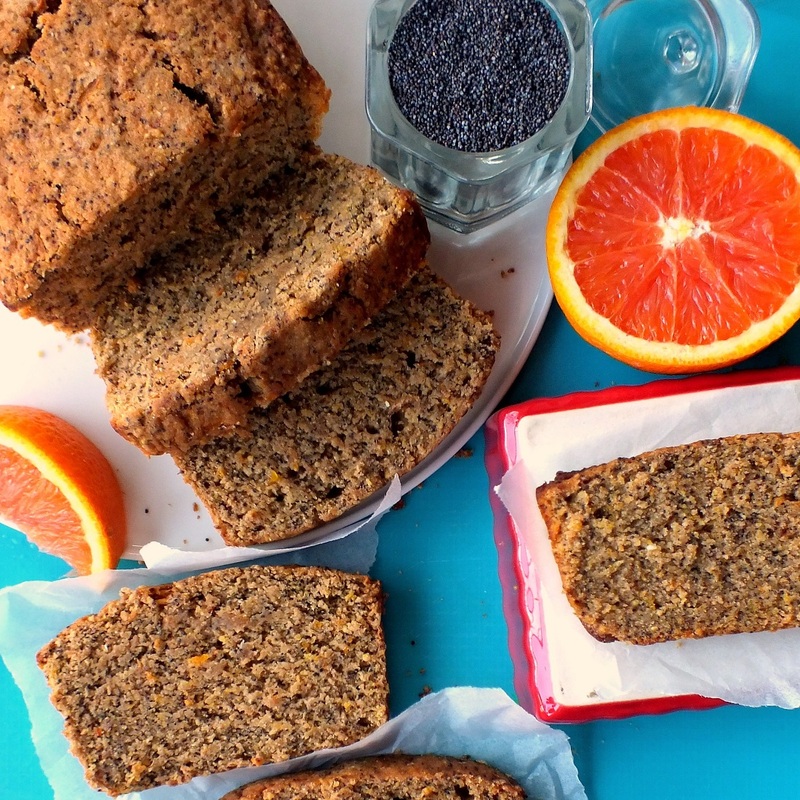 This quick bread came about because I couldn’t resist buying a huge bag of poppy seeds for $3.99 at the local grocery store. It just felt like such a steal! Then it sat in the pantry because I couldn’t figure out what to do with it! Until now. 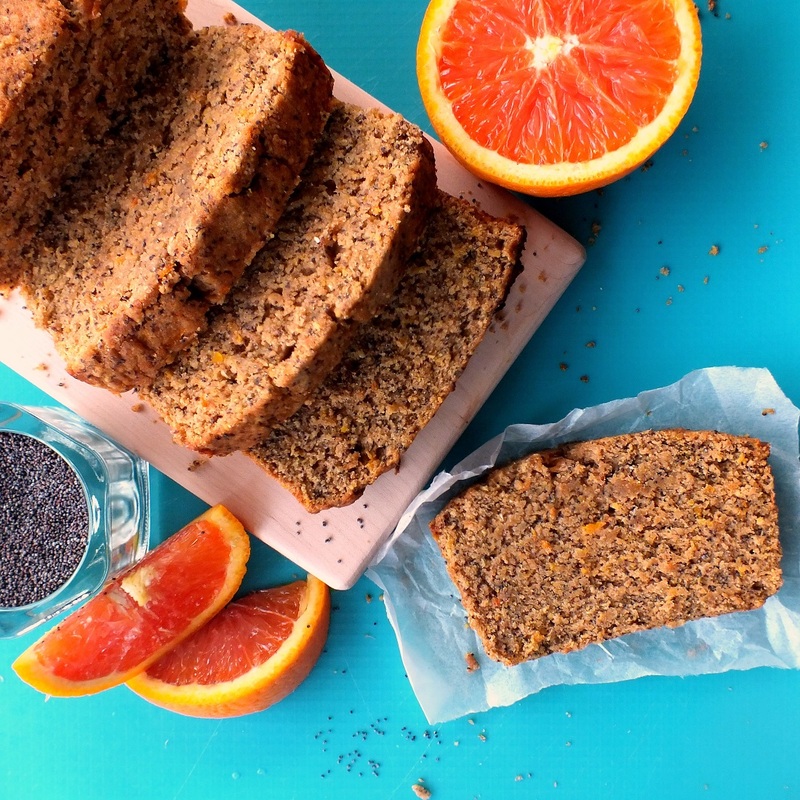 And although lemon poppy seed paired together is a classic, in the end, I decided to pair it with cara cara oranges. Also, this is a vegan bread with 100% whole wheat flour, fine corn meal flour, and ground flax seeds soaked in water to sub for eggs! I had no idea flax seeds could stand in for eggs! I think as long as you are just subbing for one or two eggs and that the percentage of egg in the recipe compared to the other ingredients in low, it really isn’t noticeable. By itself, it is nothing like an egg, of course. I used coconut sugar as well, because even though it is equivalent in carbs and calories per serving to regular sugar, it supposedly has a lower glycemic index. Ben didn’t care for the texture of it, but tried to compliment me on my endeavor. I think it’s one of those recipes that, if one is not accustomed to a less sweet taste, no animal products, and more fiber, it can be jarring to experience, even when given fair warning. For me, it wasn’t bad. 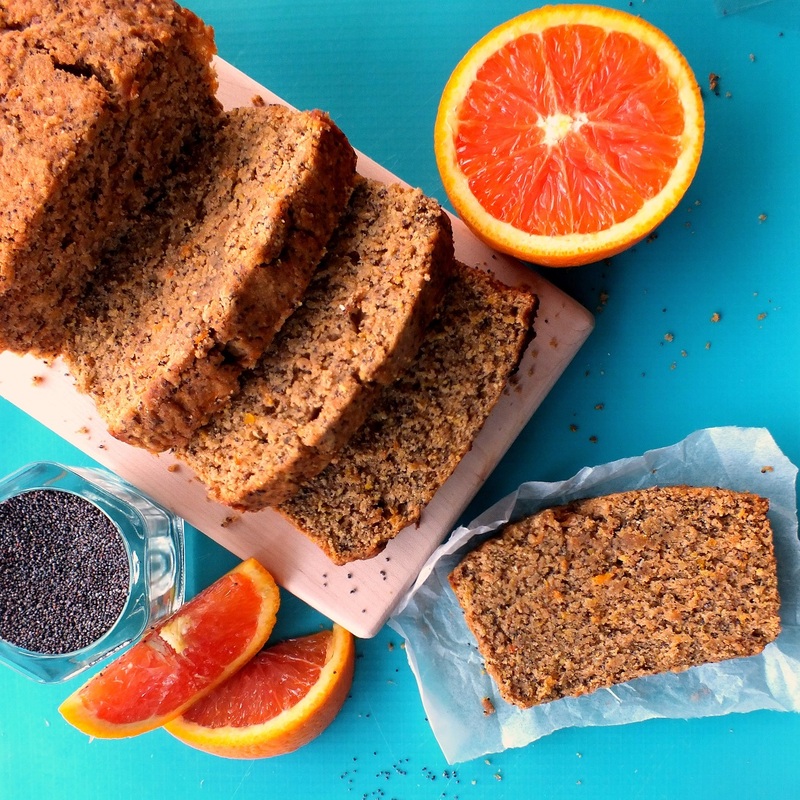 I’ll be honest, it wasn’t like other things I’ve baked that I’ve enjoyed, but I did appreciate that with less sweet, one can really taste the poppy seeds and orange flavor, and the corn meal added interest to the texture. Oh, the things that happen when you “bake on through to the other side”! I now have to watch the glycemic index of foods now. But I will not stop baking. I just have to watch what I consume a lot more. These can be made into muffins, too. If using flax seed eggs, prepare two flax seed eggs. *flax seed egg = 1 Tablespoon of ground up flax seeds soaked in 3 Tablespoons hot water for 15 minutes. Heat oven to 350 degrees F. Prepare a loaf pan (I used an 8.5 x 4.5 Pyrex pan) by greasing the bottom and sides (I used baking spray with oil and flour) and placing a parchment paper with a couple of inches of it hanging over the long sides. Sift together the flours, coconut sugar, baking powder, and salt. Add the orange zest to the flour mixture and stir with a whisk thoroughly to disperse and break up zest from clumping together. Add to the prepared pan and smooth out the top. I mixed a teaspoon of agave nectar with a 1/2 teaspoon of orange juice and poured it over the smoothed out top, tilting the pan slightly to let the agave/oj mixture to coat the entire top surface area. It made for pleasantly slightly browned edges and corners of the bread. Bake for about 55 minutes, 40 minutes if using a 9 x 5 loaf pan. Remove from oven after toothpick test in center comes out clean, and let sit for 10 minutes in pan, before removing to a wire rack to cool. Can serve warm, or let cool. 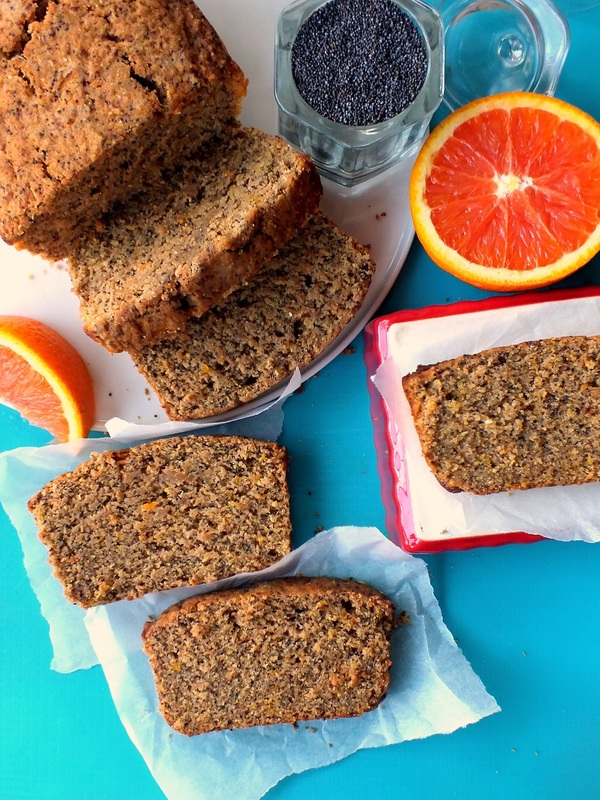 This entry was posted in baked goods, baking, bread, coffee cake, dairy-free, dessert, food blogging, low sugar, muffins, quick bread, snack, vegan, whole wheat and tagged cara cara oranges, orange poppy seed bread, poppy seeds. Bookmark the permalink. Ha! I’m just glad I didn’t wait too long, although I didn’t see any expiration date, so poppy seeds probably last a fairly long time. On the other hand, I’m guilty of letting other things expire quietly in my pantry. Thanks for stopping by! This is so beautiful! It’s like a loaf of pure sunshine! Aww, thanks so much! And thanks for stopping by! I love orange and don’t use it nearly enough. This bread sounds amazing! Thanks Julie! It was definitely a turn to more healthier recipes than what I’m used to, but the poppy seeds help make it feel more decadent to me. Sounds like some pretty healthy stuff. Don’t we all buy huge bags of ingredients and then start wondering what to do with them? I bought this extra huge bag of potatoes. Boy-I have tried every potato recipe under the sun because I need to finish them before they start sprouting. 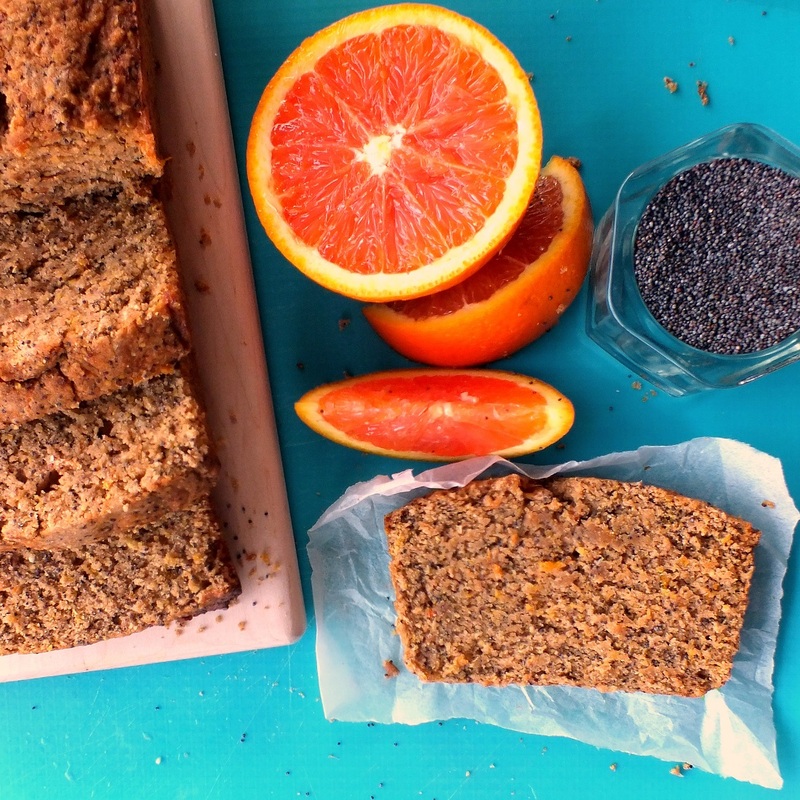 Congratulations…now you have a huge bag of poppy seeds minus 3 tablespoons. Welcome to the club!!!! Flax seed egg? new to me but thanks for sharing! Haha! I definitely know what you mean. I guess the good thing about poppy seeds is that they probably last a long time? I’m guessing. Or else I’ll have to use a lot more than what I’ve been using. Yeah, the flax seed egg. I can’t say it’s really good, but it is healthy, and works in a pinch if you are out of eggs, as long as the egg in the recipe isn’t a major part of the dish or baked good. It’s good when you only need to sub a few eggs in a recipe that has a greater percentage of other ingredients. Definitely can’t make a custard or omelet. Can you imagine? Happy baking and cooking, Liz! !